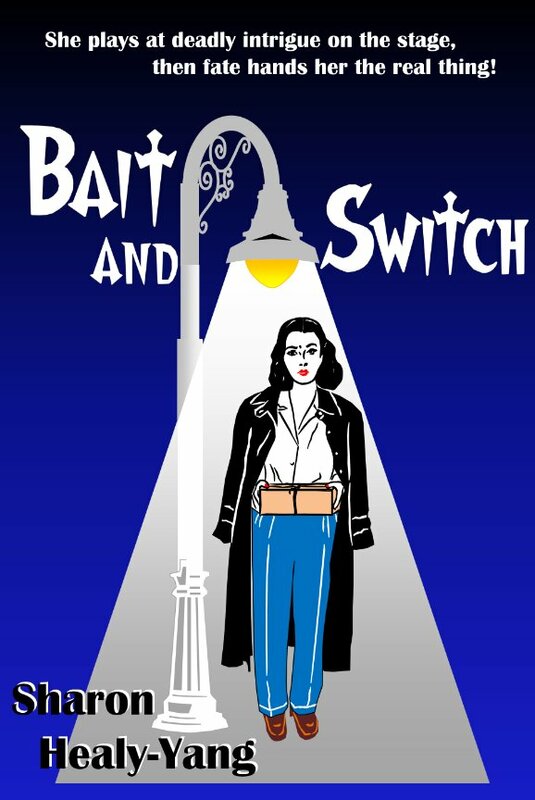 Bait and Switch now available for pre-order; release date 12/15! I can’t tell everyone how excited I am that Bait and Switch is now going to be available. If you want the Kindle edition, it’s now available for pre-order through Amazon (click here), and the official release for all versions (paperback and electronic is December 15th – next week. As a little preview, I’d like to share the cover art with you here. My husband Yang and I designed it and executed it. I love that it captures a ’40s noir/pulp-novel ambiance. Would you believe that Yang used me as the model for the figure? Well the body/clothes/ hair. The face is, um, a somewhat younger. Just for fun, note that the lamp is actually based on the WWII blackout street lamps that directed light downward, keeping submarines or potential bombers from seeing the city. My husband is the tops, working away over the weekend to put my initial design into such an elegant form. I owe him a lot. I thank my publisher and Jacqueline of all trades Sheri Williams for skillfully transferring our mock up to a finished product, slaving away into the wee hours to get things done – and done right! I appreciate it! I hope the this cover sets a mood that the novel will carry through for your enjoyment. In these times of holiday stress, a little tale of murder, espionage, and wise aleck cats always provides a pleasant distraction. I’ll have additional info for you after I finish grading some more papers! I have a day job, too! If I’ve piques your curiosity about Bait and Switch, click here for a sneak peek. P.S. I’d also like to give a tip of one of my many hats to my friends at Touchpoint , especially Leslie-Anne Garrett Stephens and my colleagues and students at Worcester State for encouraging and supporting me.